La Jicarita: Is There Justice for James Boyd? Is There Justice For James Boyd? 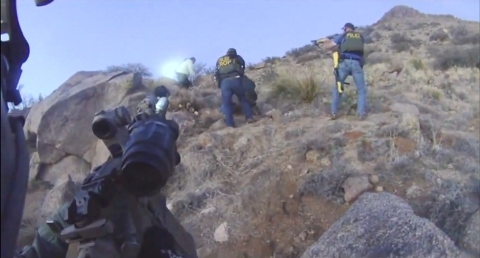 On March 16, 2014, officers of the Albuquerque Police Department attempted to arrest a homeless man named James “Abba” Boyd for “illegally camping” in the Sandia Foothills. But instead of removing him or arresting him, they killed him. He became the 22nd person killed by APD since 2010. Less than a week later, the City released a disturbing video of the shooting. Lapel camera footage from one of the officers shows Boyd, visibly tired after a long standoff with APD officers, ready to finally walk down the mountain. In his final moments, he grabs his bag and makes a move to come down. But they fire a flash-bang grenade at his feet. Boyd is startled and drops the bag. “Please don’t hurt me,” he yells. They sic a police dog on him. It menaces him. He raises small knives in defense. Police are swarming. They have assault weapons. But the chaos quickly resolves in agreement. He tells officers he’s coming down. “I’m going to try to walk with you.” He turns away from officers, maneuvering to surrender. They fire fatal shots into his back. These [proposed] reforms [of APD] offer a seductively simple, straightforward explanation for Boyd’s senseless death. These were bad cops: poorly trained, heavily armed and incompetently led. [And] Mayor Berry and Chief Gorden Eden are betting their professional and political futures that we will agree with them. The video is shocking. The images linger. What explains the senseless shooting death of James “Abba” Boyd? The anger and sadness that the video—watched by at least a million people—provoked served as catalyst for thousands to take to the streets of Albuquerque, searching for answers. On Tuesday, March 25, more than a thousand people marched through Downtown to APD headquarters, where they occupied the steps of the police department in organized rage and resolution. On the following Sunday, a protest called by hacktivist group Anonymous was less organized, more raw. For much of the day and into the night, protesters roamed around Downtown, marched on APD—up to the University of New Mexico and Nob Hill and back Downtown again. Police in riot gear and military equipment rode around town in mounted patrols and urban assault vehicles, brandishing truncheons and pointing assault rifles at people. They fired tear gas to disperse angry but peaceful protesters. Mayor Richard Berry called the protesters violent, but there were no injuries to point to, no property damages more serious than one case of graffiti to show—just images of tanks in the streets and menacing lines of riot police discharging pepper spray and advancing on angry young people who ducked for cover as tear gas canisters rained down on them. When APD killed 17 people between 1987 and 1991, community leaders demanded and received reforms related to training, but people kept dying in police shootings. The spontaneity and rage of the protests and the protesters—they briefly occupied I-25 and swarmed the Nob Hill police substation—frightened City Hall and launched the story into the national and international news. What were the protesters mad about? The killing, of course, but also a political structure digging in its heels. Berry was asked if he still thought APD was the best police department in the country. He said yes. Outrage. He began making statements to the press from what appeared to be an underground bunker. Police Chief Gorden Eden claimed the shooting of Boyd was justified. More outrage. Berry backtracked, and Eden has all but disappeared from public view. The Boyd killing and video shifted the ground under their feet. Their heels are digging in quicksand. Critics of APD grew by the day. They got louder and more organized. Nearly 200 people packed the Albuquerque Center for Peace and Justice on Monday, March 31, and they emerged with demands for resignations, recalls and indictments. Berry and Eden reacted by offering reforms: more non-lethal weapons, better crisis intervention training, more transparency, collaboration with the Department of Justice and more money for training. These reforms offer a seductively simple, straightforward explanation for Boyd’s senseless death. These were bad cops: poorly trained, heavily armed and incompetently led. [James Boyd’s] violent death brought into sharp focus the cruel connections linking poverty, mental illness, policing and violence. These are connections made strong in New Mexico, a place where one of the nation’s highest rates of police violence is matched by an equally high poverty rate. Berry and Eden are betting their professional and political futures that we will agree with them. Officer Keith Sandy, who fired the fatal rounds at Boyd, had previously been fired from the New Mexico State Police for lying. New scrutiny of police training has revealed a troubling “shoot-first” focus. APD’s heavily armed response to the Anonymous-summoned protest two Sundays ago more closely resembled a military operation than anything that anyone might recognize as policing. And Eden’s bumbling news conference after the Boyd killing and his subsequent refusal to release lapel video of the police killing of Alfred Redwine on Tuesday, March 25, offers no evidence or assurance of competency. So let’s adopt these reforms and more. Let’s raise hiring and training standards. Let’s give bite to the currently toothless police oversight commission. Let’s demand the release of all lapel and helmet camera videos of every police shooting—all 37 since 2010. These are important reforms; families of APD's victims have been calling for them for years. And Mayor Berry, who once stonewalled their calls and obstructed their efforts, now joins the chorus. But the chorus is singing a tired old tune. When APD killed 17 people between 1987 and 1991, community leaders demanded and received reforms related to training, but people kept dying in police shootings. The police oversight commission was created in 1997 when a decade-long period ended with 31 people dead by police violence. A “reformed” APD promptly went on a shooting spree, killing 23 people in the six years that followed. Perhaps the question should not only be “What explains the senseless shooting death of James ‘Abba’ Boyd?” It must also be, “What explains the relentless history of police violence in Albuquerque?” And there are no simple answers to that question. But we may begin to seek an answer in the hard life and violent death of James Boyd. 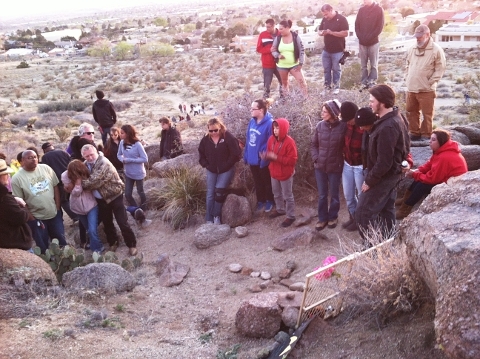 Vigil-goers gather around a small shrine erected where James "Abba" Boyd died. Some added flowers and candles behind a rock cross constructed on the spot where he tried to camp on the night of March 16, 2014. On Tuesday, April 1, the day after the community forum on APD violence at the Peace and Justice Center, US Marshals shot Gilberto Angelo Serrano in the head while trying to serve a parole violation warrant at the corner of Bridge and Sunset in Albuquerque’s South Valley. He was listed in stable condition at UNM Hospital. While on the scene, I interviewed an eyewitness to the Serrano shooting, Gabriel Valdez. Sheriff’s deputies had seized Valdez’ cell phone because he was filming the bloody aftermath of another police shooting in Albuquerque. I asked if he’d been following the recent protests about police violence in Albuquerque. He said yes. “I knew James Boyd when he was a kid,” he told me. “You did? How did you know him?” I asked. After juvenile detention, as an adult, Boyd spent time in the Metropolitan Detention Center on various charges; one, an assault against a police officer, was dismissed because he was declared mentally incompetent to stand trial. On at least two occasions, Boyd was committed to the Behavioral Health Institute in Las Vegas, N.M., the only psychiatric hospital for adults in New Mexico. Long stretches of homelessness were punctuated by involuntary commitments to the Institute that often followed short stays in jail in Albuquerque and Las Cruces. On the night of his death, with Eastside homeless shelters closed upon the arrival of warm weather, Boyd made his way to a favored spot above the popular Copper Avenue Trailhead in the Sandia Foothills. Maybe he picked it because it was secluded, a place where he might not need the small knives he carried to protect himself when sleeping on the streets. And then Boyd did what hundreds of thousands of other Albuquerque residents also did that night. He lay down his head to go to sleep. And this we called a crime. It was violence and pain, not safety and security, that defined Boyd’s everyday experience. His violent death brought into sharp focus the cruel connections linking poverty, mental illness, policing and violence. These are connections made strong in New Mexico, a place where one of the nation’s highest rates of police violence is matched by an equally high poverty rate. We have produced a city where violent confrontations with police are always only a matter of time for people like James Boyd. And this is precisely why families of victims of APD violence, those with so much taken from them, demand that APD stop treating homelessness and mental illness as crimes. So it’s time to join those mourning families and recognize that their fight for justice is everyone’s fight. It’s time we make a different city with a different future; one that finds ways to care for people rather than confine them, to comfort rather than coerce them. These are not merely demands; they are moral imperatives, and they are all of ours. And there will be no justice for James Boyd or any of the other victims, until we refuse to accept the pain and violence of homelessness and mental illness and instead build a community in which everyone, including James Boyd, finds a sacred right to a safe life. Read more from La Jicarita: An Online Magazine of Environmental Politics in New Mexico at lajicarita.wordpress.com.